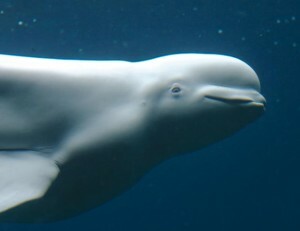 An article in Current Biology includes a recording of a captive beluga whale mimicking human speech. Recently the recording has received a great deal of press attention. I like to think he was singing. The whale’s name was Noc. He was captured in 1977 and entered into the U.S. Navy’s Marine Mammal Program in San Diego. He died in captivity in 1999. Noc sang this way only as a juvenile. Once he reached maturity, he stopped.